When Carlos Santana and record label legend Clive Davis were planning the sessions for Supernatural, they must have had, as one of their goals, to work with as broad a variety of artists as possible. Thus you have "Smooth" featuring Matchbox 20's Rob Thomas, and "The Calling" with British guitar legend Eric Clapton. Latin pop stars Mana weigh in with "Corazon Espinado," while songwriter/rapper Everlast contributes "Put Your Lights On." Two songs that share common musical DNA are "Maria Maria," featuring Wyclef Jean and Jerry Duplessis, and "Do You Like the Way," with their ex-Fugees bandmate Lauryn Hill. While both include rapping and melodic vocal lines, Do You Like the Way is far less pop-oriented than Maria Maria, and contains a funkier, street vibe -- with some nods to '60s R&B music. Comprised of just one 2-chord progression (Em - F#m), Do You Like the Way, written and produced by Hill, starts with horn pads. They are soon joined by a very stylized wah-wah guitar rhythm, straight out of a '60s TV show theme song. Lauryn Hill's rap is underlaid by a combination of vocal melodies and harmonies, both of which float underneath the rap with almost random timing. Santana eventually steps in with some crunchy riffs on his Paul Reed Smith guitar. Later, Hill is joined by rapper/singer Cee-Lo on the chorus. On it's own, Do You Like the Way certainly stands as an interesting example of the current culture. The lyrics are well-crafted and timely, both the rapping and singing are well done, and the rhythm section (complete with six horns) sets a compelling groove. However, as a Santana song, it's a bit of a misfit. 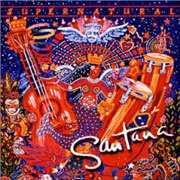 As usual, Santana's playing style fits comfortably into the track, though it doesn't seem to add much. And with the unchanging, awkward two-chord progression (minor chords, a whole step apart), the harmony becomes monotonous, which doesn't leave Carlos much room for melodic expression. So while it's admirable that Santana was trying to embrace all different musical cultures on Supernatural, Do You Like the Way seems to be one of the less compelling of the songs on that groundbreaking album. Can't we all just build and live, can't we, can't we?